Car dealer Rybrook is to manage Rolls-Royce Motor Cars’ seventh showroom in the UK. Set to open in the first half of 2016, Rolls-Royce Motor Cars Bristol will be at Cribbs Causeway, north of the city. Responsible for sales and servicing across the South West of the UK, the showroom will serve customers from an area of more than 12,000 square miles from Lands End, through Wales and up to the Cotswolds. 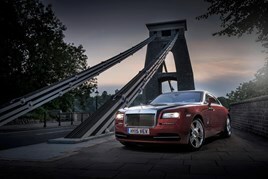 Rolls-Royce Motor Cars Bristol is Rybrook’s second Rolls-Royce franchise. It operates Rolls-Royce Motor Cars Birmingham. Construction of the showroom is due to start in October, and will open officially to customers in the spring. The launch of the new Bristol showroom will create 46 new jobs. The opening of Rolls-Royce’s seventh UK showroom will help the brand expand its presence across its domestic market, and signals Rolls-Royce’s confidence in the continuing success of the UK economy as it continues to grow. Henry Whale, managing director of Rybrook, said: “The opening of our new showroom in Bristol represents a significant investment for Rybrook at a time of growing confidence in the British economy.